I spoke at Australia's premier non profit conference for leaders and directors over the weekend. More information on the conference here. Corrinne Armour captured the spirit of the event in a series of great sketches available for download at http://extraordinaryfuture.com.au/newsflash. For those who prefer words here's the short paper that accompanied my talk. Today’s boardrooms are increasingly governed for weakness. Many directors no longer direct their organisation into strength but monitor and cross examine their management out of fear and an unchallenged acceptance of a failing model of corporate governance. Experts and regulators cannot be allowed to fashion the boardroom through their distorted vision that focuses on individual and organizational weakness. We must build a new vision for the boardroom that concentrates on what directors can do to foster the strength, resilience and endurance of the organisation. An organisation is a separate legal person. It has personal/individual sovereignty and owes nothing to any person that it has not promised. Resilience is a measure of the organisations' ability to make and keep the best possible promises. The stronger and more resilient an organisation the longer it is able to fulfill its purpose. Whatever an organisation’s individual and unique purpose, they all share the same S.R.E objective. Whether for profit or not, all organisations rely on trade and their commitments for S.R.E. Commercial is just another word for sustainable. Learn to direct by commitments to your organisation’s members, each other, the state, your employees and all other TRADING PARTNERS. Get beyond numbers by focusing on assets then cash. Seek out and understand your organisation’s assets and ask whether they are both valued and valuable to your trading partners. Every director must share an understanding of how the organisation works and how best to trade its assets. You can’t imagine a team of surgeons having their own opinion of a patient’s anatomy, so why accept each director having a personal view of their organisation. Aim for S.R.E. Personal duty sets the bar too low. Direct within the law but not too the law. Boards do not direct alone. Everyone knows there is a line that divides the board and management. What we don't realise is that for some of the time they’re on the same side of the line and need a plan to work together. Directors are part of the “Third Team” made up of the board, the CEO, the executive and others. The Third Team is vital to an organisation’s success and arguably the most neglected and misunderstood. All teams needs need team rules. Rules are the mechanics that connect the Third Team to an organisation’s S.R.E. To realise an organisation’s S.R.E directors must be strategic in the way they spend their time and energy. Deliberately choose when to guide and motivate, when to commit, when to help and finally when to build and develop the board and the rest of the Third Team. These are the four “Modes of Directing”. 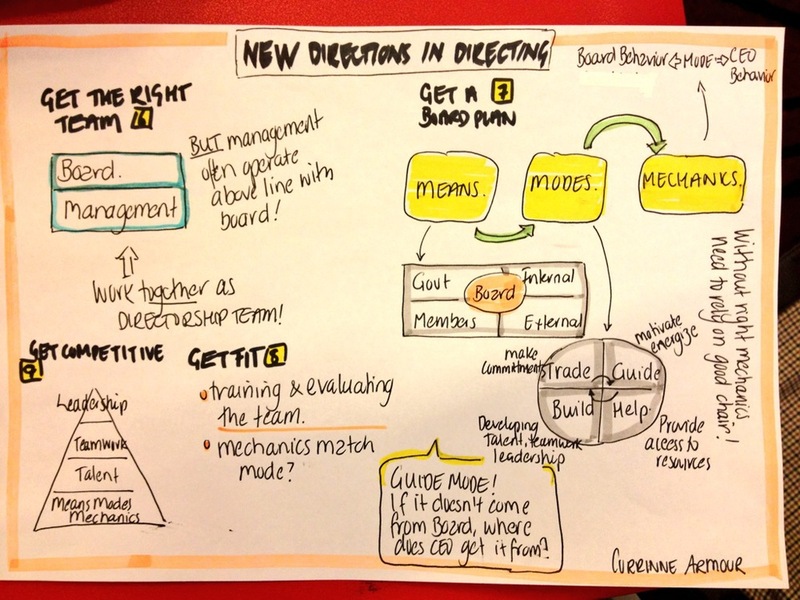 Switch the Mode of Directing to match the organisation’s circumstances and realise your board’s potential. Shakespeare wrote “all the world’s a stage, and all men and women merely players. They have their exits and entrances, and one man in his time plays many parts”. So it is with the board and the Third Team. Every member of the Third Team has a different part to play depending on the Mode of Directing. The key is to adapt roles, behaviours and tasks to ensure everyone is aligned. Fail to adapt and you will break the mechanics. Testing for broken mechanics in your Third Team. What you think is a personality problem is probably broken mechanics. Learning and practicing the right mechanics. My steps won’t fit into an orthodox worldview. You’ll need learn and adapt before you can put my steps into practice. Forgetting most practiced corporate governance. It was never designed for the not profit sector and, if you look at the evidence, much of what passes for best practice doesn’t work. Remember talent and diversity is not a strategy. No amount of talent will save a Board who’s only plan is to watch in fear. "Unlike the natural sciences, where paradigms are used to explain and predict, corporate governance is socially constructed. Paradigms in our discipline are normative models, used to discipline and guide. The major stumbling block to shifting paradigms is recognizing the element of choice. We aren’t stuck with what we have. We can choose to move to a whole new paradigm, if it offers a better foundation for building the kind of world we want." What kind of boardroom do you want? One governed for weakness or directed for strength?